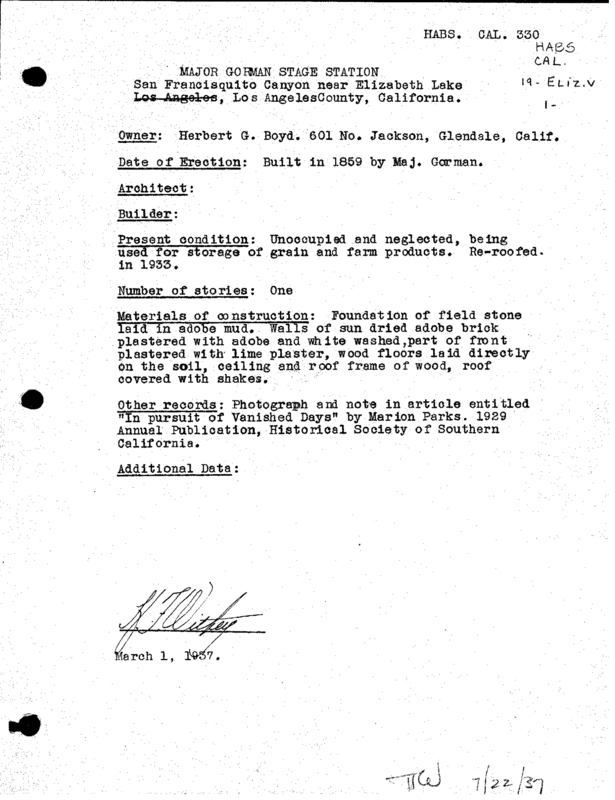 Historic American Buildings Survey report (HABS CAL-330) by Henry F. Withey, March 1, 1937 (page 2 of 2). Station incorrectly identified as "Major Gorman's." Major Gordon's Station was erected circa 1859 by Aneas Gordon along the Butterfield Overland stagecoach route on San Francisquito Road (aka San Francisquito Canyon Road), four miles southwest of Elizabeth Lake and 20 miles north of the future town of Saugus. Update: It was located at what is now 38839 San Francisquito Canyon Road, just southwest of Green Valley. It was razed in the 1960s. See map below. According to historian Bonnie Ketterl Kane of the Ridge Route Communities Historical Society, Aneas Gordon had previously operated Gordon's Ferry on the Kern River, near present-day Bakersfield. An overhead cable was used to move a ferry, large enough to carry a coach and six or more horses, across the river. The next stop along the route south out of San Francisco was Fort Tejon (est. 1854). Gordon sold the ferry in 1859 to Joseph Gale and apparently came to the Elizabeth Lake area at that time. According to Kane: "In 'Saga of El Tejon,' Lopez said that 'old' Major Gordon did not stay long at Gordon Station after the stages began running. He sold to Luke Smith and moved to Santa Paula where he died about 1875. Luke Smith then dies and the stop becomes known as 'Widow Smith's.' She sells to Tom Delano, who again calls the stop 'Gordon's Station.'" It should be noted that Harris Newmark said he stopped at Gordon's Station in 1856. It's possible Newmark had the year mixed up, inasmuch as he wrote his reminiscences from memory, 60 years later. While it appears that "Major Gordon's Station" and the Butterfield "Widow Smith's Station" are likely at or near the same place, there also appears to be some confusion in the naming of the place over different dates. Goddard Bailey, a United States Post Office postal inspector based in San Francisco, made the first trip of the Butterfield Overland Mail from San Francisco to Saint Louis, Mo., commencing Sept. 15, 1858. He was charged with supplying an official report to Postmaster General Aaron V. Brown with an official on the stations and the distances between them. The report was filed in October 1858. In the report, Bailey clearly identifies this station as being "Widow Smith's" and identifies its location as being 24 miles from "French John's" and a further 10 miles onward to "King's"[a][b]. Waterman Ormsby, in his 1858 description of the east-to-west journey of the first Butterfield run, does not specifically mention this station[c]. Roscoe and Margaret Conkling, in their Butterfield study published in 1947, also indicate that "the names of two others, John F. Gordon, and a Mr. Wilburn" were also associated with this station[d]. What appears to be at issue is the date and order of transfer between Anaeas Gordon and Luke Smith. The matter of reference by Harris Newmark to a stop at Gordon's Station in 1856 could also relate to a stop at Widow Smith's, using a more familiar vernacular ("Major Gordon") at the time he wrote his memoir. None of the above is intended as a criticism of others' contributions and research. Rather, it is merely to point out an historical anomaly in the record  an anomaly we would all be well served to sort out. a. Bailey, Goddard. "California  Arrival of the Overland Mail  Itinerary of the Route," as reported in the New York Times, Oct. 14, 1858.
b. Bailey, Goddard. Report to Postmaster General A.V. Brown. Full itinerary as reported by De Bow's Review and Industrial Resources, Statistics etc. ; published by De Bow's Review, New Orleans and Washington City, 1858. See specifically "Internal Improvements - 1. Wagon Road to the Pacific," pp 719-721.
c. Ormsby, Waterman L. "The Butterfield Overland Mail (Only Through Passenger on the First Westbound Stage)," original publications, New York Herald, Sept. 26 to Nov. 19, 1858; republished by Henry E. Huntington Library and Art Gallery, San Marino, Calif., 1942-1998.
d. Conkling, Roscoe P. and Margaret B. "The Butterfield Overland Mail, 1857–1869" (3 vols), Glendale, Calif.: A.H. Clark Co., 1947. As an aside, Kirby, who lives in Houston, is pursuing a federal designation for the original Butterfield Overland route as a historic trail, in recognition of its importance as America's first real "information superhighway," running from the Mississippi River to the Pacific Coast. Further Reading: Gordon's Station and Ferry by José Jesús López, circa 1930. The remains of Major Gordon's Station were photographed and surveyed in 1936 and 1937 by Henry F. Withey, Los Angeles District Officer for the Historic American Buildings Survey (HABS). At the time, the property was owned by Herbert G. Boyd of 601 N. Jackson St. in Glendale, Calif.
HABS surveys were performed at historic sites across the country under the auspices of the Works Progress Administration, one of several agencies established under FDR's New Deal to create government-sector jobs during the Depression. In his survey, Withey  an architect of some renown in Los Angeles during the 1920s  incorrectly identifies Major Gordon's as "Major Gorman's Stage Station." According to Kane, Major Gordon's was unrelated to Gorman Station (in Gorman) or to the man for whom the community of Gorman was named. Photographs from 1936 at the Autry National Center, sourced to the Southwest Museum (and presumably emanating from Withey), corroborate the name of the station as "Major Gordon's." According to Withey's report (HABS CAL-330), the station had a "foundation of field stone laid in adobe mud (and) walls of sun dried adobe brick plastered with adobe and whitewashed; part of front plastered with lime plaster, wood floors laid directly on the soil, ceiling and roof frame of wood, roof covered with shakes." It was re-roofed in 1933. "Foundations are of field stone laid in adobe mortar. Walls are adobe with some field stone mixed in. Walls plastered inside and out with a plastic adobe mixed with sand. Front or south gable wall over porch, lime plastered. All other outside walls heavily whitewashed. "Walls of rooms No. 1-3-4 whitewashed, walls of Room 2 papered. Ceilings and roof projections whitewashed. Doors sash and trim painted slate gray. Floors, including porch, are 1"x6" matched pine flooring laid on 2"x4"s flat on ground. "Roof framing has not the appearance of being original material. Roofing is of redwood shakes recovered in 1933. Soil has washed down from the north, raising grade at rear of building. Rear wall leans outward, by reason of settlement, about 1'-0" at peek [sic] of gable. This occurred before the roof was reconstructed. Adobe chimney has been protected with sheet metal scraps. Adobe brick are 4"x8"x16", 1/4" joints. An occasional header course but no attention paid to vertical joints." At the time of the HABS survey, the structure was "unoccupied and neglected, being used for storage of grain and farm products," Withey writes. He notes that a photograph and reference to the station were included in an article titled "In Pursuit of Vanished Days" by Marion Parks, published in 1929 by the Historical Society of Southern California. Kane, Bonnie Ketterl, "A View from the Ridge Route Vol. II: The Fort Tejon Area," Bonnie's Books, Frazier Park, Calif., 2002, Pg. 139. Communication from Bonnie Ketterl Kane, Nov. 12, 2012.